I have always believed that you can discern from tape study exactly how teams feel about their players. The way in which players are specifically utilized within the framework of larger schemes is the analytical measuring stick. Think of it this way: If a corner rarely plays press man, it’s a given that the team does not believe he is capable of executing that coverage. They are trying to minimize his limitation, so it is not exposed and does not become a reason for a loss. While the premise applies to almost all positions, it is certainly most evident at quarterback. Case in point: the 2011 San Francisco 49ers. Alex Smith threw the fewest passes of any 16-game starter. That did not happen randomly. Jim Harbaugh carefully evaluated Smith’s strengths and limitations, and came to a defining conclusion: It was smarter to design a run-based offense with a primary objective to minimize mistakes (Smith threw a league-low five interceptions), as opposed to attacking proactively with the pass game. It was the right approach. That’s called outstanding coaching. I strongly believe you can extrapolate that general principle to the NFL draft. Organizations and coaches express their world view — what they want to be as a team — with their draft picks. I am not talking about the selection of individual players (i.e. this particular player over that particular player); I am speaking more generally about the positions targeted, and then more specifically, the attributes of those players. That addresses what kind of team they envision themselves being, how they believe they can best compete and win in the NFL. Look at the Detroit Lions. This was a team that imploded defensively the last half of the 2011 season. The consensus was that side of the ball had to be the No. 1 focus early in the draft. Yet, the Lions selected OT Riley Reiff and WR Ryan Broyles with their first two picks. (To be fair, their next six picks were defensive players, but the later you get in the draft, the riskier the proposition.) My guess is the fan base in Detroit was puzzled, at the very least, and more likely downright angry. When you widen the lens, the bigger picture comes into focus. This team is built around arguably the best young passer in the NFL, Matthew Stafford. With that as the overriding principle, the offensive side of the ball can never be allowed to suffer due to neglect. If that happened, the Lions could not compete, no matter how much they fortify the defense. It’s a very similar philosophy to what Bill Polian employed with the Colts once he drafted Peyton Manning. You always make sure the offense has high-level players, especially at the receiver position. You take Broyles in the second round not only because is he a very good player, but also because he becomes another complementary piece that helps Stafford — and by extension the entire team — remain a playoff and Super Bowl contender. It’s the longer view, and the correct one. In Philadelphia, defense was the focus of the draft. But let’s peel back the layers and look a little deeper. 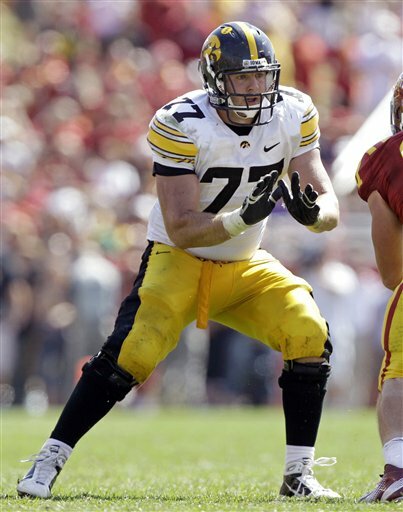 What kind of defensive players did the Eagles draft? That speaks to their NFL profile. They see the game through the prism of passing. You win by throwing on offense and defending the pass on defense. No team so defiantly adheres to those principles as does Philadelphia. You defend the pass in two ways: pressure and coverage (with pressure being the primary element). 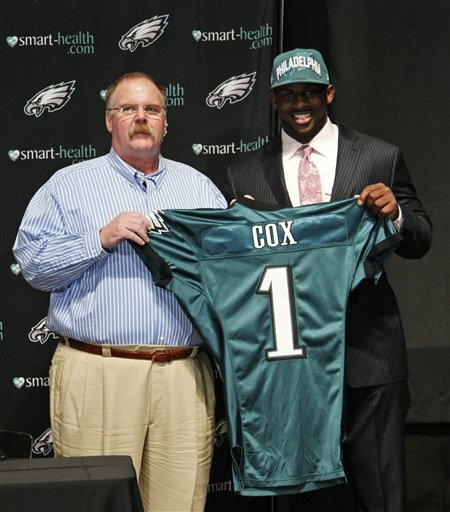 The Eagles traded up to take Fletcher Cox with the 12th overall pick and they selected Vinny Curry in the second round. Both Cox and Curry are pass rushers, first and foremost. Their ability to play the run was not a relevant consideration in the process. The Eagles’ world view is clear (and has been for some time): You can never have enough pass rushers in a passing league. The brain trust adamantly believes you don’t fail to compete in this modern-day NFL because of your inability to defend the run. That’s not even on their philosophical radar. How about the Tampa Bay Bucs? They are the polar opposite of the Eagles. Their draft told you how they see the world, and therefore how they want their team to look and play in 2012. New head coach Greg Schiano is old school, a believer in the principles that have defined football, in one way or another, since time immemorial. The CliffsNotes version goes like this: You run the ball, you play physical defense, you limit mistakes and the result is an opportunity to win every game. 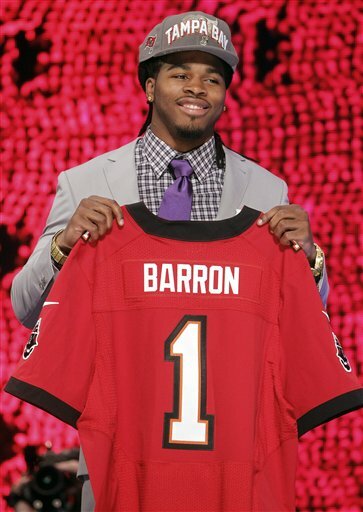 In an NFC South division that features Drew Brees, Matt Ryan and Cam Newton, plus a number of high-level wide receivers, the Bucs selected safety Mark Barron with the seventh overall pick. Barron is an outstanding player, one of the 5-7 best prospects in the draft. Then, with the 31st selection, they chose running back Doug Martin, another very good prospect. Think about it: a safety and a running back. Two positions, in the larger context of NFL football in 2012, that are not seen as premium or priority positions. The reason: Their value in the passing game is perceived to be minimal. Beyond top RB Trent Richardson, Martin was the only other true feature back in this class. You do not draft Martin without the expectation of having him carry the ball 15-plus times a game as the foundation of your offense. Three organizations. Once you step back and think about the process — and the reasoning behind the selections — you understand how they see the NFL and their place in the larger landscape.